North Carolina’s agricultural industry contributes $84 billion to the state’s economy and employs more than 1 in 6 North Carolina Workers, according to the Department of Agriculture & Consumer Services. Two of the state’s lead agricultural products—sweet potatoes and turkeys—will grace many Thanksgiving tables on Thursday. North Carolina’s rank in sweet potato production. North Carolina has led the nation in sweet potato production since 1971. Our state produces nearly three times as many sweet potatoes as California (629 million pounds), the second highest producing state. Mississippi (493 million) had the third highest production in 2016, followed by Louisiana (152 million). All other states combined produced just 180 million pounds of sweet potatoes in 2016. The number of pounds of sweet potatoes produced in North Carolina in 2016. This is the largest amount ever produced and exceeds total U.S. production from just ten years prior in 2006. Although Hurricane Matthew’s threatened the state’s sweet potato crop in October 2016, much of the crop had already been harvested, preventing even greater damage. 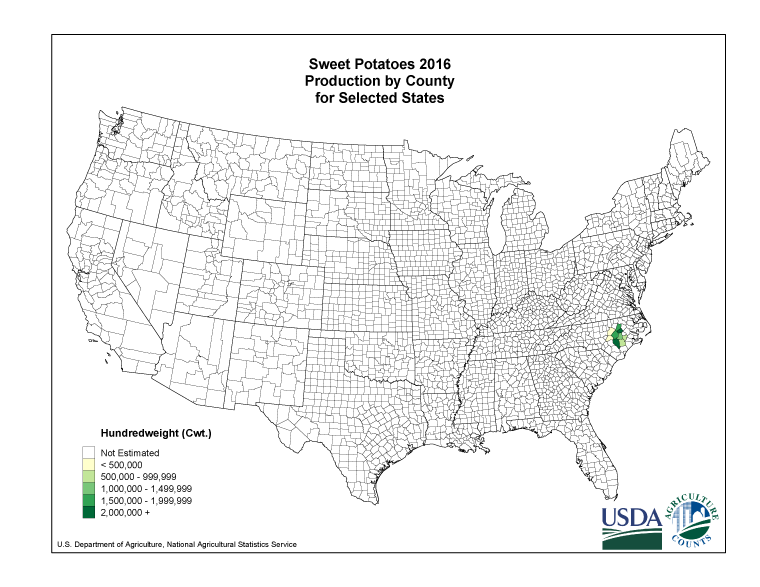 The share of U.S. sweet potatoes produced in North Carolina in 2016. 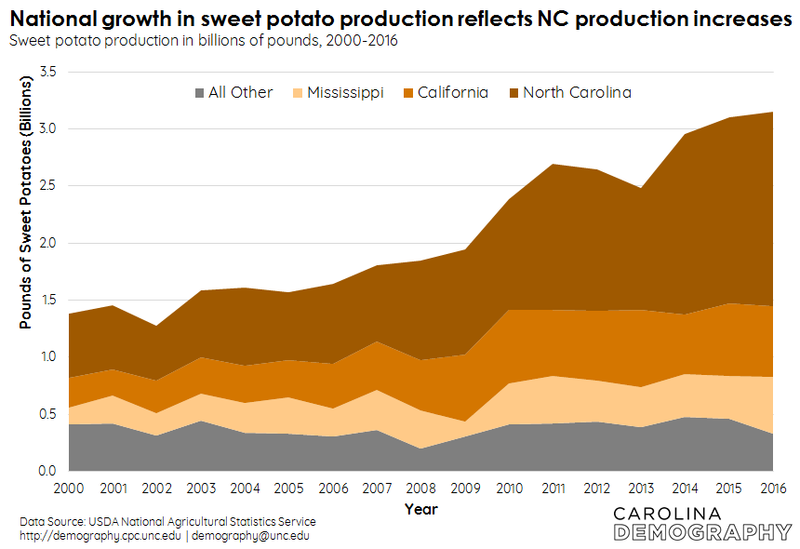 For the past three years, North Carolina has produced the majority of sweet potatoes in the United States. Number of North Carolina counties that produce more sweet potatoes than the state of Louisiana. In 2016, Louisiana produced 152 million pounds of sweet potatoes, the 4th largest amount of any state. Four North Carolina counties—Sampson (272 million), Wilson (213 million), Nash (184 million), and Johnston (179 million)—produced even more. *Note: not all counties report production values. Edgecombe County is among the state’s leading producers of sweet potatoes but did not report specific values in 2016. This entry was posted in Carolina Economic Data, Fun Maps and tagged sweet potatoes, Thanksgiving, USDA. Bookmark the permalink.